The Four Kings Casino & Slots is a rich social online multiplayer casino gaming experience. Launched on June 1st, 2015 on Steam and December 8th, 2015 on PS4, The Four Kings offers many popular casino games including Poker, Blackjack, Roulette, Craps, Baccarat, Slots, Keno and Bingo. Players can meet friends, complete quests to earn chips, play in tournaments and events, compete for a spot on the leaderboards and win rewards to customize their own 3D avatars. The Four Kings is a living, breathing world constantly evolving with new content. See more at casino.digitalleisure.com, or check out the game page on Steam. Basically, jumping in wherever I can help! 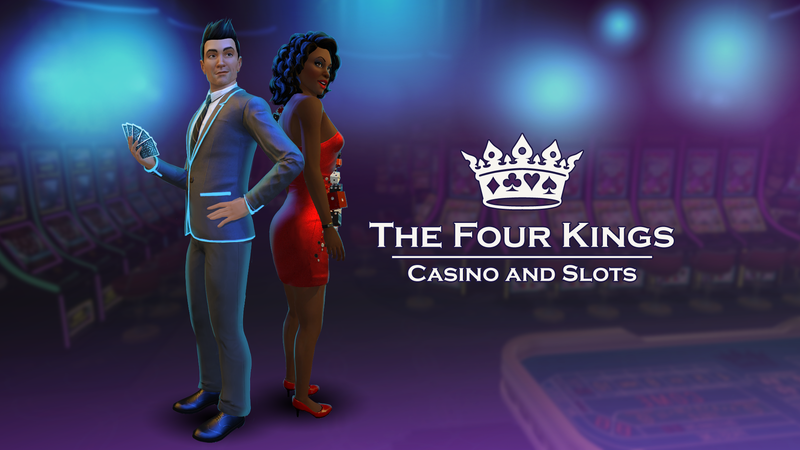 It’s been 3 years since the original game launch, and The Four Kings Casino and Slots is still going strong! There has been a ton of updates since then, so we wanted to create a fresh trailer to show off all the new features. I storyboarded, directed and edited this video. Camera controls were added by Zach Stock, and several of our coworkers created avatar characters to help fill out the group scenes. As a game trailer, we wanted to keep it short and snappy with quick cuts to keep the viewers’ interest. One of the slot machines I worked on was Treasure Trap, with a jungle temple theme and a diamond-shaped symbols layout. This game is particularly art-heavy compared to our other machines due to the bonus round. Hitting the bonus in Treasure Trap sends players deep into the lost temple, searching for ancient treasure, unlocking doors, navigating their way through hidden traps. Unlucky adventurers may find themselves lost or victim of the dangers within the temple. Fish & Chips was the first slot machine I worked on. This aquatic-themed slots game features a 1024-ways to win design and an “Eat or Be Eaten” bonus round, where players get to prove themselves to be the biggest fish in the pond in order to win the jackpot. Particle systems & 3D machine & topper models for both games were made by Andrew Distefano. My biggest project during 2016-2017 was a major redesign of the in-game UI. In the months after launch, it became obvious that our menu systems needed refining. Users were having trouble finding and using many of the game’s features, and major systems were not being communicated clearly (including avatar customization and our VIP system). This led to a high level of frustration with our player base, which we dealt with through FAQ on our forums and through private tech support and email. 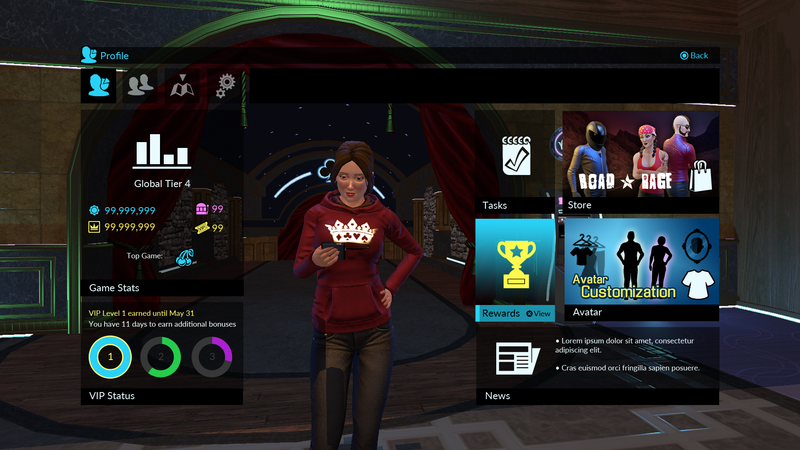 Therefore, the goal of the redesign was to increase the level of communication with players, both to let them know what events were happening in the casino, and to make finding features and information more intuitive. We also introduced a new Notifications section of the HUD, which lets players know about tournaments, free games, free chip giveaways, and other events going on in-game. This is an expandable system to which we hope to add even more functionality in the future. Additionally, the new menu design requires less memory and is designed to have a much more consistent look and function across all menus. Implementation of the new UI design is mostly complete at this point. So far, feedback has been very positive. Messages and posts from players frustrated with the VIP system have been reduced to virtually zero, with no changes to the system itself. Overall, the new menus have been easier for players to use and understand.